Fitting your bagpipe with a water trap is absolutely essential to reduce the amount of moisture getting to your reeds. It also reflexes your hot, moist breath to the back of the bag and away from your reeds. This Moisture Tube has been specifically designed as an effective, lightweight, moisture control system that works without the use of silica gels. 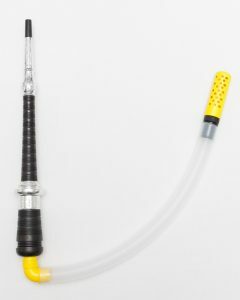 It is made up of a lightweight flexible tube connected to a compression cartridge. Warm, mouth-blown air flows through the tube and when passing through the cartridge it is compressed, causing the warm air to cool and humidify within the cylinder. The cartridge is fitted with a breathable cloth which can help with the air compression and to absorb excess moisture. The system is very easy to remove and fit. It is easily dismantled allowing for speedy and efficient cleaning.